Farming Simulator is often among Newzoo's monthly list of the top 20 most played PC games in North America and Europe. That statistic isn't quite as surprising as it once was. We've long moved past being shocked at the fact millions of people enjoy simulated agriculture. What is interesting, however, are the other games that you'll find among that Top 20. Games like Rocket League, GTA V, Dota 2, Rainbow Six: Siege, League of Legends, Counter-Strike, Garry's Mod, Overwatch, Warframe and PUBG. The Top 20 list is almost exclusively full of multiplayer games, most of them have communities built over many years and a bunch of them are big within the world of modding. As a sim game, Farming Simulator may stick out amongst that selection of hit PC titles. But actually, when it comes to what it offers as a game, it's not too dissimilar. "That's the reason why [Farming Simulator] works as an esport," says Christian Ammann, CEO of the game's publisher and developer Giants Software. "If you watch what all those games have in common, they are all multiplayer, maybe a third have modding, half of them are esports titles... so we share a lot of commonalities with the other games. "Compared to other new entries in the esports area, we have an established community and have been in the market with our products for almost ten years. We have seven years of experience with multiplayer gaming." Like most things with Farming Simulator, what may seem ridiculous from the outside, isn't quite so surprising when you take a closer look. An esports league for a farming game may seem unusual, but it's just another case of the game reflecting the real world. "At the first look it seems curious, but when you think about it, it makes more sense," Ammann continues. "There are a lot of competitions going on in the real farming world. Whether it's tractor pulling or ploughing championships, and in the US there's the seeding contests, where they compete for the best yields. And popular in Germany is tractor driving. Those are real world, physical competitions. So the whole topic of farming is not short of real competitions, but of course, in the virtual area it is completely new. We have been experimenting for quite a long time now, and we like to think we have something exciting to share with the world." Indeed, Farming Simulator began looking into esports 18 months ago. Its community had already started organising competitions without any involvement from Giants Software. But the developer took notice, and decided to try some competitive tournaments at various real world events. "There are a lot of competitions going on in the real farming world. 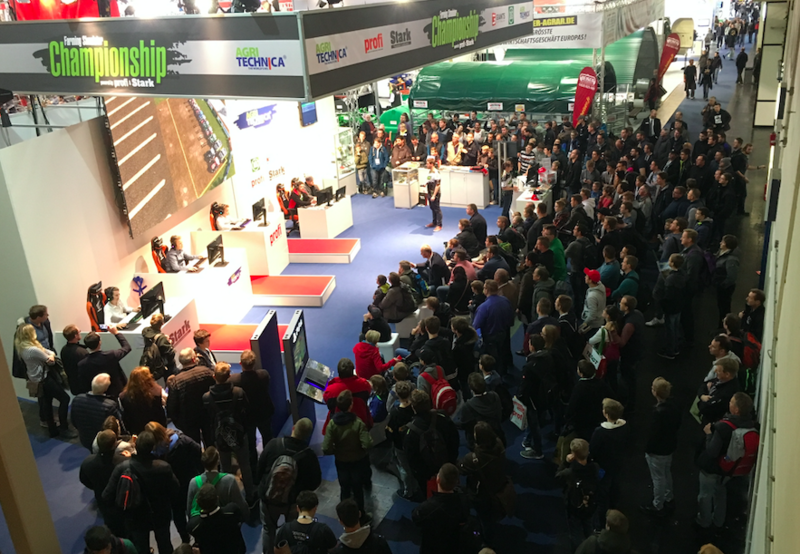 Whether it's tractor pulling or ploughing championships, and in the US there's the seeding contests, where they compete for the best yields"
"There was this first initial tournament we did at the Agritechnica, which is a fair for farming technology in Germany. We just thought we'd try it, and the feedback was so big that we had to continue and so the whole thing evolved out of that," Ammann explains. "We had four events in the first season. We saw teams that had playbooks, they had made charts on where to drive first and they trained almost every day. We were very surprised. They got super fast over the course of the tournament. It was crazy. They trained every day and played all the time and you really saw the progress of the teams. "We were thinking about ways of making it more interesting this year, to make a league, and make sure it is something people will enjoy playing but also enjoy watching. And through that, we came up with the concept of the FSL." This year's Farming Simulator League is significantly more advanced. To get it to work last year, the developer modified Farming Simulator 17 and each player would take it in turns to achieve the best times. This time, Farming Simulator 19 has been built with a mode specifically designed to be a more exciting esport. Two teams of three players can now compete head-to-head against each other at the same time. Giants is currently working on a patch that's designed to improve the viewing experience, and will also ensure the game is fair for all competitors. The firm is developing a map that will mean no team will get an advantage because of a larger field or a more flat environment. The game also boasts a €250,000 prize pool -- something Ammann was keen to secure to ensure the new Farming Simulator League was taken seriously. "Our goal was to be a tier-3 esport event," he says. "To reach a certain level of importance, certainly for the audience but also the partners and the events that invite us to hold a tournament, those tier levels are crucial. With the help of Intel, Logitech, Noblechairs and Nitrado, we have achieved the prize pool of a tier-3 league. "Also, a certain prize pool is important for casters and people who re-stream our livestream, and commentate on it in their local language." A big prize pool, a fair environment for all players, a focus on making the game fun to watch; so far, so very typical of most esports. What is a bit different, however, are the players. Although Giants is targeting professional teams, they expect the bulk of the competitors to come from the game's modding community, and also the various agriculture brands who are involved in Farming Simulator. "The League is also easy for people to participate. You don't need an invitation. Our idea is to offer an esports for everybody"
"We have teams that are heavily involved in user-created content for the game," Ammann says. "They are huge fans and have been for many years. The modding teams are the ones that we had in the experimental season one. There are some famous modding groups like Creative Mesh or Vertexdezign. They are already famous and have already won competitions in modding contests. "We have another group that are manufacturer teams. The farming world is made up a lot of brands and our game has them licensed in there. We presented the concept of the League and the new game mode to them, and a lot of them will have official manufacturer teams. Which is a bit like the Formula 1. They are brands like John Deere, Case IH and New Holland, who will bring teams to the League. Most of them will be using people from within the company. If you're an apprentice in that company, the chances that you're playing Farming Simulator is quite high. So it's easy for them to find people who know the game and would like to participate." He continues: "The League is also easy for people to participate. You don't need an invitation. We will have a lot of tournaments. Gamescom takes place over a lot of days . We will open the registration for almost everybody that wants to join. We'll see how fast we fill up the slots. Maybe they'll be filled up in a couple of hours, we don't know. But our idea is to offer an esports for everybody. "And then the last two days of each event would be for the established teams, the qualification phase, and the last day will be the livestream finals with eight teams going head-to-head." The final question, then, is why? What does Giants Software get out of building a Farming Simulator esport? Ammann says it's not so much about generating money, but keeping the audience engaged. He told us how the firm has seen significant growth in livestream viewership (up to 30,000 concurrent viewers last year) since experimenting with esports. The aim is to push that even further. "It's important that we can enrich the whole ecosystem of Farming Simulator," he concludes. "Which is something we've been doing for many, many years, through various things. Like supporting different platforms, such as mobile and consoles. Also, in the area of multiplayer, where we have supported dedicated servers for many years. And modding, too. We were one of the only companies that has full modding support for consoles. We were the first company to have rich user-generated content on the PlayStation 4 -- even before Bethesda did it with Fallout 4. "We always try to enlarge our ecosystem and make the products more and more interesting to a larger audience. And that's what we're doing here." "For many of our fans, Farming Simulator is one of the very few games they actually play."